The modern model jeans are made from quality fabrics, characterized by a slight thickness. In this regard, the denim wears out faster and is wiped. This is particularly noticeable in such places as the edges of pant legs, pockets, patches on the knees and between the legs. 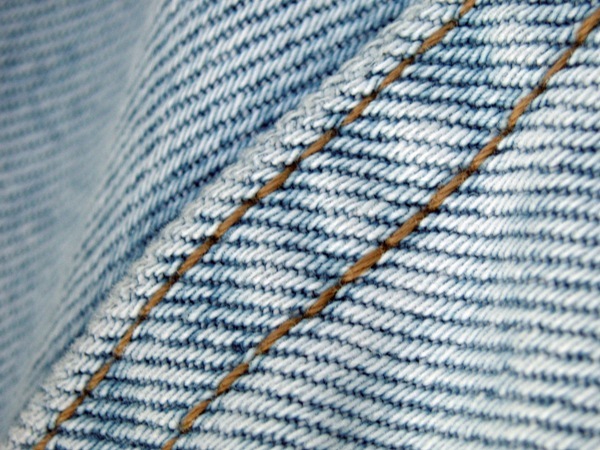 Extend the life of your favorite jeans you can use a neat patch that will hide worn seats. Pick appropriate fabric for the patch: it can be denim, and conventional. Try to accurately select the color. If the fray jeans made from a stretch fabric tenesaca, find a patch of the same texture. Wash and iron the jeans. Circle around the perimeter of the damaged area with a piece of chalk or soap. If jeans were worn on the leg between your legs, you will need to make the patch symmetrical. To do this, fold the fabric in half and staple it with pins. Attach the cloth to the affected area and tap with your fist along its perimeter, to a transfer line drawn on jeans. Cut a patch and divide it into two equal parts, pre-pulled pins. Check out the quality of machine stitching on the other piece of fabric. If the result suits you, experiment with the types of stitches and choose the right one. To the edge of the patch has not frayed and it is not divided into separate threads, again revealing a grated site, treat both parts at the edges of zigzag stitching. Turn jeans the wrong side and face down, attach the patch to the damaged tissue. Secure it with pins. They should be located in the direction that will route of machine stitching – otherwise the foot will push them out of cloth. Pins can also fall under the needle or in the mechanism and break them. Around the perimeter of the patch lay line. Below patches were not strongly noticeable, choose thread in the color of the fabric. Their thickness should correspond to the thickness of the fabric. Remove the pins and fasten the thread. Then on the perimeter, handle the patch with a zigzag. Move in a circle and gradually narrow circles. Thus, you will seal the patch and the damaged tissue. Zigzag covering the entire surface of the patch, secure the thread, making three stitches in the same area of tissue.